The HOLLSTEIN 11,000 Lbs. 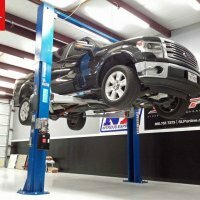 Premium Two Post Lift is our most popular lift for commercial applications and heavier vehicles in general. 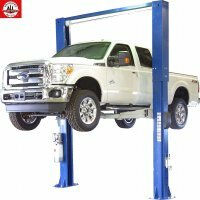 The strength and power of this lift out-performs any 10,000 lbs 2Post lift without raising the purchase price.The lift can support up to 11,000 pounds of weight. 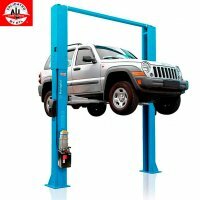 It's three-stage front arms support both symmetric and asymmetric applications, making this one of the most versatile car lifts in its class. Single Side Safety-lock Release ensures quick and safe disengaging even with heavy vehicles. Our most popular lift for commercial applications and heavier vehicles. Width Overall with Power Unit 145-1/2"
Width overall at bottom/outside edges of plates 137-1/2 "